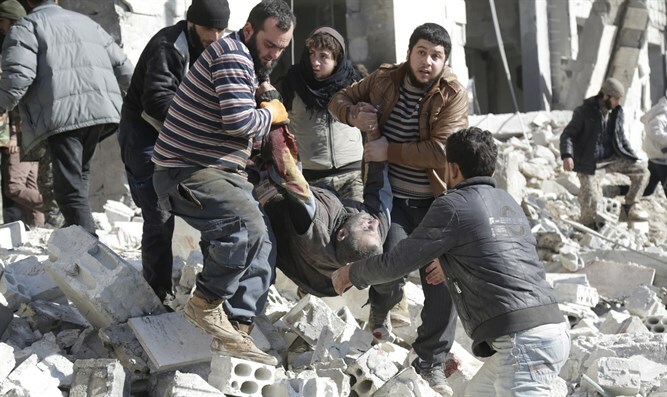 Barrage of air strikes near a hospital in northwestern Syria kills at least 10 civilians. A barrage of air strikes near a hospital in northwestern Syria on Saturday killed at least 10 civilians, said the Syrian Observatory for Human Rights. The monitor said the raids targeted the town of Milis in Idlib province, which borders Turkey and is controlled by a rebel alliance led by Al-Qaeda's former Syrian branch. The Britain-based monitor said three children and two women were among the dead, adding that the raids were carried out by either Russian or regime warplanes. The Idlib Media Center, which publishes news on developments in the province, said a hospital was hit in the raid by unidentified aircraft and that at least six people had been killed. The World Health Organization said Syria was the most dangerous place for health care workers to operate last year, with 135 attacks on health facilities and workers in 2015. Just last week, a maternity hospital supported by Save the Children was bombed in an air raid in Idlib province, causing casualties and damage. In late July, four makeshift hospitals and a local blood bank in Syria's battered Aleppo city were hit by air raids in a single day.